Rumkommen - Travel Reports - Oh, Caledonia! 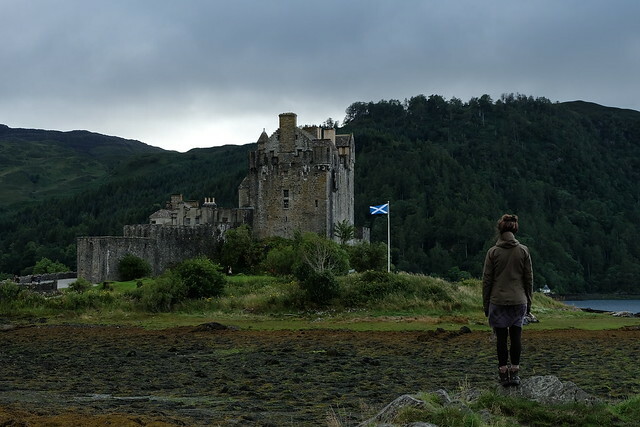 Somehow we got stuck in Scotland for five months. After we helped a family in Dornie around their property we hitch-hiked away from the west coast towards the east coast. For these two weeks the famous Eilean Donan Castle was our neighbour, we explored the surrounding lochs on an old life boat from the 1930s and chopped, processed, sanded and painted loads of wood. Further east and south we then arrived to the farm Woodlea Stables in the Kingdom of Fife. Jock and Fiona have about 350 free range chickens and a small artisan bakery where they produce „Real Bread“ the old fashioned way: slowly and by hand. This place kind of captivated us. We planned to stay there for eight weeks and suddenly four months have been passed. In this time Hanna developed a passion for cooking and baking bread and pastry. Albi gained basic knowledge about woodwork and learned how to care for chickens, collecting and cleaning eggs, building compost heaps, and catching chickens. We had a very good and intense time at the farm. We have now parted ways as a couple, but not as friends and (for now) travel companions. This little delightful spot brought us a lot of change and we are now learning how to deal with it. We're not sure what our immediate futures hold, but this is a good thing. Having said that, a few things are clear: We're going to be in Charlestown for the next few of weeks and help to refurbish and extend an old cottage in a conservation village. Hanna also broadens her horizon about cooking/recipes together with Cat and Rob. They run an organic and seasonal catering service. Scotland, the country where you always have time to talk about the weather, where busses are making detours for you, where you can buy an egg battered with haggis, where you have to cope with four seasons in four hours. Oh Caledonia, we grew fond of you!